During the development stages of our new adjustable kerf steel door frame it was important to ensure on a 90 minute application, the door would close and latch properly from a distance of 18”. Our first step was to develop the proper rabbet dimension, along with the right door seal. We used an adjustable stop, and two different profiles of door seals, ½” and 5/8”. After testing it was determined the ½” door seal (Schlegel Brand QEBD 5000) ensured a secure fit between the door and frame. In addition, it allowed for proper closing and latching. 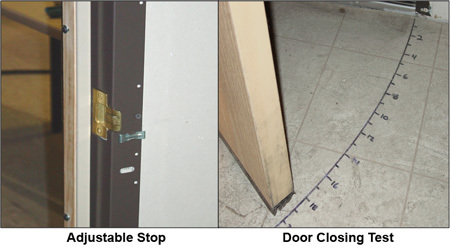 Our frame must utilize the ½” profile door seal. The next step was to establish proper interference between the door and the sweep. Several sweeps were used, and required different clearances in order to ensure there was not excess interference which would create closure problems. It is important to consult the factory, and allow us to test your door and sweep to determine the proper interference. Our TA-1 adjustable T-Strike comes standard with all of our frames, and allows for ¼” of adjustment in the field. All of the above will ensure an opening that closes and latches in the field every time.